Famous Londoners – Paddington Bear.. This week we pay tribute to author Michael Bond, who died last week at the age of 91, with a look at the life of his most famous literary creation – and an iconic London character – Paddington Bear. Paddington came to life in the late 1950s after, on Christmas Eve, 1956, Bond, then working as a BBC cameraman, famously purchased a teddy bear as a present for his wife, Brenda. He named it Paddington thanks to the fact that they were living near Paddington Station at the time. The first book featuring Paddington – A Bear Called Paddington – apparently only took 10 days to write and was published on 13th October, 1958, by William Collins & Son. Paddington, the story goes, arrived in London’s Paddington Station as a stowaway sent from “deepest, darkest Peru” by his Aunt Lucy who had gone to live at a Home for Retired Bears in Lima (his aunt had taken him in after he was orphaned in an earthquake). The bear – who is based on the Spectacled Bear, South America’s only native bear species – was found at the station near the lost property office by Mr and Mrs Brown, wearing an old bush hat and sitting on his suitcase with a label around his neck which read “Please look after this bear. Thank you.” (The label, Bond later revealed, was inspired by memories he had of evacuees fleeing the Blitz in London). The Browns named the bear Paddington after he told them they wouldn’t be able to pronounce his real name (it’s actually Pastuso) and took him to their home at 32 Windsor Gardens (for more on that location, see our earlier post here) where he subsequently lived with them, their children Judy and Jonathan and housekeeper Mrs Bird. The family learn that he had made the journey from Peru in a lifeboat and had been sustained by marmalade along the way – his favourite food. The subsequent stories – Bond wrote 13 novels as well as picture books and, thanks to the success of the early books, he was able to retire from the BBC to concentrate on writing in 1965 – focused on Paddington’s adventures in London. As well as the books – which have sold millions of copies around the world, there’s also been several TV series and a 2014 film, Paddington, with a sequel, Paddington 2, to be released later this year. Among other interesting facts about Paddington, who commonly is seen wearing a blue duffel coat (with a hood and wooden toggles) and Wellington boots, is that he has two birthdays – the Browns weren’t sure how old he was so they started at age one and agreed he would have two birthdays each year – one on Christmas Day and the other on 25th June. He also often carries a marmalade sandwich under his hat “in case of emergencies”. There’s a life-sized statue of Paddington at Paddington Station (the work of Marcus Cornish, it was unveiled by Bond in 2000, three years after the author had received an OBE for his services to children’s literature – a CBE followed in 2015 ), and in a touching tribute after Bond’s death, people have been leaving marmalade jars alongside it. 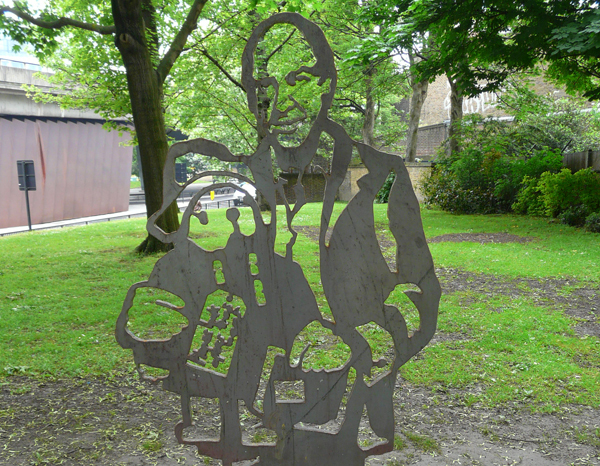 There’s also an artwork depicting Bond with his creation at the southern end of St Mary’s Terrace, one of a series of works depicting famous local people (pictured). For more on Paddington, check out the official site www.paddington.com.